Wow! This is absolutely gorgeous! I can’t believe your countertops aren’t stone. They look so good, and those light fixtures were a great find! We are finally starting our kitchen reno this week. We are keeping our existing cabinets, so it won’t be as major as this. This makes me so excited though! The before and after is unbelievable! Ah thanks!! Stone was way out of our budget- I wish though! We’re definitely thrilled with our choice considering. I can’t wait to see your reno too- all aboard the kitchen reno train! I have searched your posts and pins for the name of the tile you used for your kitchen floor and shower walls. I can’t locate It anywhere. Can I please get the name from you? Btw… I love everything you have done! Hi Sharmell! It’s called san marco viva :) but I’ve heard it’s only available in Canada! This is a gasp and stare kinda reno! Love it! Haha thanks so much Annnie! We are in LOVE with it. I have a post coming up soon on how I’ve added colour and personality to it since it’s so neutral… can’t wait to share! Trying to pick our next house project!! I believe this is the post you’re looking for! https://www.lemonthistle.com/adding-personality-to-an-all-white-kitchen/ Let me know if you have any other questions. It definently is! I’m about to purchase a fixer upper. We are signing papers TODAY! :) & we have to do all the renovating ourselves to fit our budget. It’s exciting! Where did you get the flooring for the kitchen? I’ve been looking all over for something like it! Congratulations!! That is the most exciting thing :) The flooring is San Marco brand in Viva, colour linen. That said, I’ve heard that you can’t get it in the States. Laaaame! Canadian and European only. But Home Depot has a cheap tile we used in our entry that is 12×24 with a similar colouring and pattern. We did splurge for the stone counters and floors, but I am going to show those lights to Jeff because I am BIG puffy heart in love with the industrial schoolhouse look of those! What a wonderful job you did on this beautiful kitchen! Kudos to you both (and baby kisses on appliances are a totally acceptable kind of mess). Gotta love the kitchen event!! I did a quick check on your site and can’t track down your kitchen… have you done a post on it? I’d love to see!! So much satisfaction :) We definitely love our open shelving, thanks so much for the sweet comment Maryjo! Thanks so much Shelby! I’ll take that compliment 10x over :) I do spend most of my day in here… and I don’t even mind. colleen! i’m in awe over like 5 different things right now – 1) how did you have the time to do this renovation with all the other things going on in your life? 2) the renovation is so, so good! and 3) how are your kids getting so big?? And IDONTKNOW how they got so big!! It just happened and they’re like toddlers, not babies anymore?! Love your kitchen! But where did you get your rug? Colleen it’s beautiful!! I love every bit of your labor of love. You guys worked so hard. Did you do that all with babies around? Or was it just before? Regardless, I’m impressed. We’re trying to figure out how to finish the top of our cabinets in our kitchen. I too hate the idea of cluttering it with anything, but I despise thinking on how much dust is collecting up there. So something has to be done… Not sure where our cabinets are from… We saved all remnants of all the ones we tore out, so maybe that’ll help. I digress.. Your kitchen is helping. I’m also interested in looking into your countertops.. They look great! I’ll be back for more, haha, thanks for sharing! Aw thanks so much Karissa! We were staying with my Dad while we did the bulk of the kitchen reno, so we abused the free babysitting services :) When I was researching I saw that some people built extra cabinets above their existing ones to close it in? I’m not sure how that would go… but I think I will miss having the space up there to put Christmas garland up this year! Our kitchen could really use some touchups. It’s not in horrible shape – our house is only 12 years old – but it’s slowly starting to wear in some areas; The laminate is starting to bulge at some of the seams, and the appliances sing some interesting songs from time to time, so we’re definitely considering replacing those at some point, and adding some kind of back splash. Thanks Kara! Our apartment kitchen was the same way, made some minor updates but didn’t replace everything. Backsplash makes such a big difference, I’d definitely recommend it! And good on ya’ for ripping off the wooden border, a lot of people would be afraid of wrecking them, I love fearless DIY! It’s beautiful!! Your new layout compared to the old was such a good idea. Your open shelving is so attractive and… seriously, everything looks lovely! Thanks so much Elisabeth! We love the new layout, now that we have it I can’t imagine living with that tiny kitchen! That open shelving was really easy to make and cost SO little compared to a cabinet, win win! What an absolutely beautiful transformation! I love that your counters are formica–so much more affordable and looks gorgeous! Can you tell me what type of edge the counters have? Thank you! Gorgeous transformation!!! It’s not even the same kitchen! I absolutely love your backsplash. And I’m so with you on the baby smudged stainless steel appliances. We just call it kitchen art now. ;) Beautiful beautiful job! i really like the tile may i ask what brand or where you got it from? would love to have this in my kitchen. How do you feel about it in your shower? We’re about to redo ours and I was considering copying yours. Awesome! Can’t wait to see what you share lady! Wow!!!! This is an insanely AWESOME transformation! I love all the finishes you chose. Your kitchen looks FANTASTIC! Thanks so much for sharing it with us this week on the Monday Funday Party! Thanks so much Pauline! And thank you for the wonderful party. Ok. First off. I am so jealous! Second, I am so excited for you because that kitchen is a dream! I am so impressed with all that was done. Talk about a total transformation! In love with it! Oh and by the way. That open shelving=a dream. Perfection. Love it! Your kitchen looks great. I love the open shelving next to the window. The layout really seems to work. Your kitchen is unbelievable! I love the color and all the finishes. Those floors are beautiful. Amazing job! Thank you so much for stating where you found the cabinet pulls. I am renovating the master bath and replacing the cabinet pulls. The downside is that the old ones are 2 1/2 inches from center to center. Very hard to find pulls that size. Most cup pulls are that size, but I like the ones you chose because they are not rounded – more streamlined. Not sure what size they are, but at least I can fill in the old holes and these pulls will cover the fill in. And… if you like the hardware, you can order it from here super cheap (compared to stores) one of the kitchen companies here recommended them to us but shipping was just too much to Canada, and they come in a bunch of different sizes, so you might be able to find your specific size! I’m with Kyla! This is gorgeous and exactly what I am hoping to do with my kitchen. (When the budget fairy drops off some money:) So glad you are going to stop by our linky party and I I hope you will link up a few other projects, too, at the Found & Foraged Linky Party! Hope to see you there http://www.thebigrevealblog.com! Aw thanks so much Grace! We’re waiting on the budget fairy for our bathroom… *sigh*. Looking forward to checking the party out! Looks fabulous! I am loving the counter tops and the open dishes…(where did you get the lovely white dishes)? Aw thank you so much Jacqueline, I appreciate you stopping by :) The dishes area actually from Ikea! We’re loving them, we were definitely overdue for new ones. You can find them here. Wow that’s amazing! That’s dream kitchen material! Well done. Wow, what a HUGE transformation! Looks gorgeous! Aw thanks so much Shelly, I really appreciate that! I’ll have to stop by and say hello!! Congrats on your new kitchen! It’s looks great; so bright and inviting. Thanks so much Keisha! When we lived in our apartment that kitchen was super dark too. This is such a welcome change! WOW! This is truly an amazing renovation–I LOVE it! I can’t believe those are formica counter tops. They are beautiful! Thanks so much for linking up at Think and Make Thursdays. I am featuring you tomorrow! Oh, and it’s always nice to meet another twin mama! Aren’t twins the best?! Challenging, but so fun! I am in awe of what difference! Simply stunning. And I’m just blown away with your countertops. I’m saving this for when we build out house next year. Thanks so much Maria! I’m really impressed with the countertops too, I was so nervous about them- you can never find a sample big enough! So pretty! What a difference. I love the open shelving. Thank-you Rebekah! If you’d like to see the shelving tutorial you can find it here. Love the new kitchen! May I ask what your wall color is? I’m trying to decide between painting my cabinets white or grey. I love the idea of white but would like maybe a light grey for the walls then. Thanks Leanna! My dad is in the middle of painting his cabinets grey right now (mushroom actually) and they look great, but I’m in love with the white. The wall colour is a custom colour, I can track down the mix tomorrow for you :) Thanks for taking the time to comment! Oh my gosh! That is absolutely stunning! I love the marble on the counters, I think that stands out first…at least to me, aside from a better layout and space. You have done an amazing and wonderful job! Hummm, maybe its time for our kitchen to be redone…..LOL. This is it! I’ve been scouring the internet with all my ideas (white cabinets, marble backsplash, open shelving and stone countertops) trying to find a picture that I could finally see it all together and I found it! We have carpet, paneling and “custom” cabinets in our kitchen right now I can’t wait to get them OUT. Your kitchen is gorgeous and I couldn’t believe that your countertops are laminate! I do have a few questions about your Ikea cabinets – how well do they hold up? They look beautiful but I want to make sure they are functional and I don’t have to worry about what I put in them and if they will hold up in 10 years. I am also curious about the size of your kitchen and your budget. If you ever have time I would appreciate an email with a little more detail. Thanks so much Stephanie! Your current kitchen sounds just lovely ;) it’s nicely giving you the motivation to get on your reno! Thanks so much Meaghan! That’s so wonderful you’ll be able to make the home he knew as a kid your own! That sounds like a total dream. I will shoot you an email with all the budget information I have as well as sources etc! Thanks so much Lynn! The kitchen cabinets are Ikea Ramjos in their ‘white’, and the backsplash is a marble hex from Home Depot, I think it’s technically called ‘white marble’ but it’s definitely a gray. The paint is a really weird one- it’s a custom colour, but I have the tint if you like… This is only good for home hardware (beauty tone), I guess they have different tints- B 6 shots, H 10.5 shots, U 3 shots (for one gallon, white base). I’m so glad you like the kitchen, hope this helps! I love your kitchen transformation. What did you use on the floors? Hi – a late comment as I’m playing catch up. I LOVE what you’ve done with that kitchen – what a transformation. And yes, having an in-cupbaord bin drawer is my favourite thing about our new kitchen. In fact, when conducting a house tour I need to stop myself from bringing guests to look at that first! Colleen, your kitchen came out beautifully and I am so inspired by it!! We’ve been living with a kitchen that needs a gut job for almost 5 years and I have been considering Ikea for cabinetry when the time comes. Your experience sounds so positive with them, thank you for that feedback! Your countertops are gorgeous, what a fabulous choice to keep within your budget and still get a beautiful kitchen. 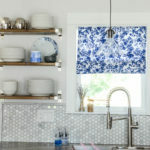 Love your backsplash, lighting, floor tile, open shelves!! Thanks so much Lisa- you’re making me blush with all the love! We can’t say enough good about Ikea cabinets. Other than this kitchen, we also used Ikea kitchens for our basement suite (you can see them here-> https://lemonthistle.com/house-update-basement-suite-done/) and in both my Dad’s basement suite and main kitchen… they’re amazing to work with! I just helped my sister in law plan her basement suite kitchen cabinets out with them last week too! In other words… we’re big fans. Where did you get the flooring? And back splash? LOVE IT! Thanks so much Tabitha! We used San Marco Tile in Viva Linen on the flooring. We also used it on our shower surround- you can check that out if you like here-> https://lemonthistle.com/?p=2866 and most of the flooring stores in town had it on order. The backsplash is from home depot! kitchen looks great and I esp love the open shelves! I did not see the tutorial for them? please direct me to this diy project. thanks for sharing and congrats again on your beautiful kitchen remodel! Love the countertops! Where are they from??? Do you remember the edging option name you chose for the countertops? My goodness this kitchen remodel is beautiful! I am designing mine at the moment and I love how yours turned out. We must have similar taste because we both have the same kenmore fridge! Anyways, great job and thanks for the inspiration. Thanks so much Crystal! I love that fridge so much! 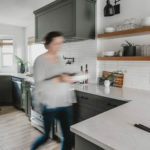 Designing a kitchen remodel can be stressful but it’s so much fun… before you know it will be done and you’ll have to come up with something else to dream about! In love with this and possibly you too! ha! Great job! I was wondering what lighting you decided on for over your table? Im looking for a light to go above my table that would coordinate with my kitchen lighting and style like yours. Aw thanks Abi! We actually bought a non matching light from Ikea, but I love it just the same. You can see it in this post here: https://lemonthistle.com/diy-salvage-copper-curtain-rods/ it works really well in our space since we have a part wall between the rooms! Thanks so much Cindy! I would love to have granite countertops one day, but am loving these in the meantime! We had a local countertop and cabinet maker install them, we had a few places give quotes and they came in the most affordable by far (although our Home Depot didn’t have anyone in the kitchen department the 3 times I went up there to price that out!). Open shelving has been a dream for us. The brackets are ikea and we used cedar deck boards, stained for the wood shelves. You are seriously so sweet… I’d love to see a photo of your kitchen when you’re all done! 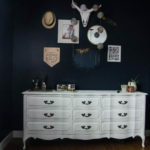 Can you tell me what color/finish the knobs and pulls are? I really love this kitchen! Love what you’ve done with your kitchen! Using a backsplash with a laminate counter top looks so much nicer! Your choice of face plates was spot on. It’s a high end look without breaking the bank. I replaced all my switches with the paddle style and used the screwless face plates. It just freshens the look. Hi there ! Live the kitchen ! Where did you find the sink ? We found it at Home Depot! It was the last one in stock and haven’t been able to track it down since. Although… hindsight we would have gone with a higher quality one I think- it doesn’t have quite the slope on the bottom we would have hoped for. Did you have your counter installed? Also what were they before, laminate? Love the look! What type of edging did you do with the formica? We are getting ready to redo our countertops. Luckily we have two friends that “doing countertops’ is their business. One of them is getting me a quote on how much he pays for Formica Soapstone Sequoia and the Formica Ideal bullnose edging. I showed my husband the pictures of your kitchen and he really likes how yours look but asked if I could find out what you did on the edging. He can and has replaced laminate countertops in rental houses but has never done anything fancy with the edge. The edge is kind of like bullnose (wrapped), but not rounded. The edge of the peninsula/island they just tapered so we were less likely to run into it. It isn’t a fancy application at all, I think the edging ‘tape’ is applied the same. Best of luck! I recently found this post, and I love the tile on the floor. I am totally inspired at how you used it in your bathroom! Can you please tell me where you purchased the tile? I am just wondering where you got the floor tile from? I love how it was used in the bathroom as well!! Thanks so much Danielle! I got it from a local tile place- Kamloops Tile, but most of the flooring stores around here at the time were carrying it. San Marco brand, viva tile, linen colour. Hello, I love your choice of laminate. I’m having trouble finding a source that is familiar with this type of edge though… where did you get yours from? wow! REALLY gorgeous!!! we redid ours a couple years ago and i keep meaning to put up the pictures. maybe this will inspire me ;-) love all the finishes you chose! Thanks so much for sharing your beautiful kitchen remodel! We’re in the middle of a whole house reno. We are starting to plan the kitchen remodel and I’m trying to sell my husband on the formica countertops. One sticking point is that we also have a peninsula in our kitchen. It looks like in your pictures that the corners of your peninsula are slightly tapered back so it isn’t a straight line. Is is that true in real life? The one thing thing I’m most concerned about is having edge/trim pieces meet with the top and the dark line that comes with joining the two pieces. My husband feels like the edge piece will eventually start peeling off. Were you able to avoid that with your set up? What edge profile did you choose? Thanks again for taking the time to blog and share your world with the rest of the world! It really helps out the rest of us silent DIYers! Yes! Our countertop guy recommended this. It’s tapered so don’t bump into it as much. We chose a ‘flat’ wrapped profile but the end of the peninsula does have that little darker edge where the end strip is on. The formica is made SO well now, I can’t imagine this piece ever peeling. We really are happy with it. Thanks so much Diana :) I can get you a closer picture of that corner if you’re interested, just let me know! Exactly, what tile is that? I love it and want the same in my kitchen!! Hi Courtney! we love our tile too. The backsplash is just from Home Depot, the flooring is from San Marco and the line is Viva, colour Linen. It was available in EVERY tile shop here in Canada, but I’ve heard it’s impossible to get in the states. Best of luck! How much did this whole project cost you? I am a realtor so it is great to refer clients to blogs like this when they are house hunting and looking in a certain price range. Hi Ashley, It came in around 13,000 not including drywall, paint, and new window (we did the whole floor). Hey love what you did your kitchen looks amazing!!! I just bought a house that has roughly the same kitchen and I love what you did. I was wondering if you would be able to send me an email with more information regarding more like a budget breakdown and any advice on how you did it your self and roughly how long it took you to complete and such if that is okay? I can shoot you the budget breakdown, and a rough estimate of timeline :) Let me know if it’s not arrived by tomorrow. Aw thank you! We did our new kitchen this year and the budget is definitely not applicable anymore- everything has gone up in price! We did the kitchen in 3 months though, start to finish (but that includes all the floors and windows in the house as well. I love your kitchen!!! What edge did you pick for your laminate countertops? Hi! Beautiful job! We are giving our kitchen a face lift and this is exactly what we had in mind! We are actually on our way home from Home Depot and I grabbed a bunch of Formica samples. Can you tell me the style of your countertops? Is it Weathered Cement? It’s soapstone sequoia from the 180FX line :) I’d love to see a photo when your kitchen’s all done! Such a gorgeous kitchen, Colleen! We are ordering this exact formica to relaminate our kitchen counters. You mention the edges are wrapped. Is there any chance to see a close up picture of this? We would love to replicate this look, if possible. Thanks! Lauren, I actually don’t! And am not home/in town right now. If you shoot me an email colleen@lemonthistle.com I can get one later this week. There is one shot in here that shows the wrap but it doesn’t show the island curved edge. Colleen, wow your kitchen is absolutely stunning! I am looking into Formica counters for my kitchen reno! The Soapstone Sequoa looks perfect in your kitchen! When I looked at the samples it looked much more brown then grey. Would you say your soapstone is grey? I want them to look like yours but I’m just worried they will arrive and be BROWN lol. Hi Ashley, Thanks so much! If I remember, there was a brown version of this as well? These are definitely a blueish undertone gray though- no brown in them at all! Love your kitchen!! We are getting ready to demo ours and start fresh, and I am using yours as my inspiration! Do you remember the name of your wall color? I love it! Thanks! Wow Beautiful kitchen, Thanks for sharing such a nice post with us. Thank you so much! We definitely love it. Great ideas! We’ve recently remodel our kitchen and some tips presented here turned out to be very useful. Thanks so much! I’m glad they were helpful. Hi, I know this post was from awhile ago, but can you please tell me what edge profile you chose for your countertops? It looks so clean yet softened. All I see as a choice for Formica is Ogee and Bullnose, neither seem to look like yours. Thanks for any help you can give… and gorgeous job on your kitchen reno!! Hi J, our countertop place told us it was a wrapped flat edge. Good luck! Hello! Very nice job^ thank you! I like your draws and pens, could you tell me the total length of them: 4-9 / 16 inches (116 mm) or 5-5 / 16 inches (135 mm)? Hello! Very nice job, thank you! I like your pulls and knobs, could you tell me is overall length of them: 4-9/16 in. (116mm) or 5-5/16 in. (135mm)? *Swoon* what a fantastic transformation! It looks like your new pantry is smaller than your old one. We’re in the planning stage of our kitchen right now and thinking off going this route to allow for a better layout and more counter space. The space should be made up with a small vertical pantry like yours as well as drawers under the new counter. Do you miss your big closet pantry at all? Thank you so much! It is much smaller BUT we never used the kitchen as it was when we bought it so this (with all that island storage) is much bigger than what we’d had in our old place! We also use the old coat closet for half pantry (all that bulk stuff)/ half cleaning supplies etc. This is gorgeous! Love what you’ve done, would you mind sharing a detailed budget of your kitchen? We are trying to assess costs and possible fixer uppers. I’d also love the details of your budget, thank you! 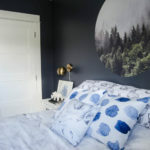 We have an identical house almost – and a tight budget and need to DIY where we can, so everything we can do to glean what this might cost us is so appreciated. Looks great! Hi Brenda, I am updating the post because we’re working on our next kitchen right now and our old numbers are totally irrelevant now- things have increased in price SO MUCH in the past four years! We are in the process of remodeling. I am also using soap stone sequoia counter tops. I am having trouble deciding on an edge. Can you remember what edge you chose for your counter? Yes! We asked for a flat wrapped edge :) Best of luck! Hi! I LOVE your kitchen, but especially your open shelving! 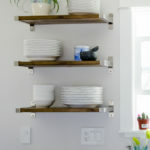 What did you use for the brackets on the open shelving? WOW!! Your kitchen is beautiful ! I plan on doing almost the same thing – knocking out a wall, moving the window and putting in a door when I eventually remodel my old kitchen. Can I ask how much you ended up spending on your total renovation ? I totally don’t know the numbers anymore! We did the kitchen, refinished flooring throughout the whole house, replaced all the windows/doors/and mouldings, all the lights, and all the paint in one three month period… so it all runs together! Colleen! This is beautiful!! Where are your countertops from?? So interested! Love your kitchen! So happy I found your post as we plan to remodel our kitchen with the exact same layout. I’ve been playing with Ikea kitchen planner but it’s nice to see it in reality. How deep is your fridge? That’s our big concern as a 36 in deep fridge will stick out so much. I’d love to know your timeline and budget for the wall removal. I love the countertops too! Such an economical choice with great aesthetics. Thank you so much Julie! Isn’t that kitchen planner fun? Our fridge is a countertop depth I think! We took three months to do all the renovations on our home before moving in… there was a lot more than just the kitchen happening so I can’t say how long just the kitchen walls would take or cost! Amazing transformation! Thank you for sharing! Hi Colleen! Your kitchen is gorgeous. Do you remember what edge you used for your counter tops? Thank you. This looks so lovely! May I ask how the flat finish on your countertops is wearing? I’m considering the same ones for our kitchen, but I’m wary of the flat finish! Does it scratch easily or show a lot of dirt? Thank you! Thanks so much Dana! The counters are AMAZING. Scratches are hidden thanks to the texture and they totally hide dirt. I’m super impressed with them four years later! I came across your design on Pinterest my husband and I are remodeling our kitchen and have a similar layout. I love your design. Can you tell me the size of your kitchen? Beautiful kitchen! What size are those tiles? 6×24? I just love this look for the kitchen! Thank you so much for sharing! Just ordered a Formica swatch of the countertops, can’t wat to see if it will work as well in my space as it did in yours! Any chance you could send me the paint color you used? Currently having a battle of the grays and would love to try it! This one is a custom colour but is almost identical to para paints cloud gray! Hi! Love your kitchen! We are looking to do the same Formica counters. Did you do the standard edge? Thanks! This one is a square wrap! I think standard is bullnose. I’m going to order your Soapstone Sequoia countertops this week because of YOUR remodel! Fantastical job! A++! I am wondering if they are more grey! Beige, or beige? Your pics look grey. My sample looks more beige. Your thoughts? Hey! Love love love the renovation! Exactly when is the IKEA kitchen cabinet sales, so you know? Also what brand and color is the wood plank tile on your floor? Approximately how much did you save by doing it yourself you think? Hey! I’m not too sure when the sales are! I think late winter for sure but I think there is another one in the year as well. The flooring isn’t actually a wood grain tile, it just has a linear pattern! And lastly… I’m not sure how much we would have saved though, we ruled that out right away! I am obsessed!!! I’m getting ready to redo my kitchen and I’d love some more info! Hey Girl! This post is from our last house and after renovating another kitchen this past year- i’ve realized the prices are no longer comparable. Such a bummer!